Angie Thien for "When in Spa"
If you're as cranky about the Bangkok heat as we are, then listen up. Your body is trying to tell you something. It needs a break, something to loosen those tense muscles and give it that summer glow. And while nothing in life is free, you can always be sure that if you treat your body right, it'll always return the favor. So it's come to our attention that The Mandarin Oriental Bangkok has created two new spa promotions specifically suited to the summer season. 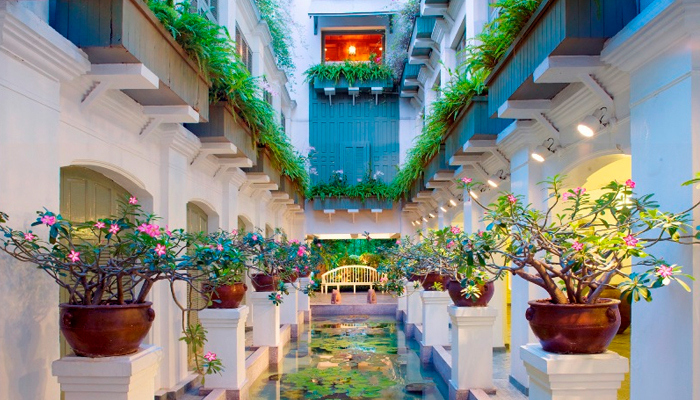 Nestled on the quiet side of the river, The Oriental Spa is undoubtedly one of the most highly acclaimed spas in Bangkok. It provides private, first-class treatments which are designed to truly heal. Simply put, they don't kid around here. Every detail from service to specific amenities have been carefully thought out, and even the most basic room has facilities for a personal shower or steam. You'll travel to the famous spa on an antique rice barge, and—after a short walk through the hotel greenery—arrive in the breezy reception area. After refreshments, it's time for your journey into bliss. With the De-Stress Muscle Release Treatment, your skin is first treated to a full polish using a special blend of herbs and oils. The body scrub is specially formulated to turn into a natural soap on contact with water. After a short shower, it's time for a muscle gel massage using black pepper and rosemary oils. The therapist will focus on tense points and expertly work out and knots or tension points you may have. Unlike an oil massage, there is no messy residue to wash off afterwards, which is a big plus if you need to head to another meeting. Another option is the Keraleeya Abhyangam Treament which includes a massage, Marma foot massage, herbal steam and herbal ritual bath. Unlike the previous massage which will help muscle tension; this one is more of a beauty treatment for summer. You'll have everything you need to relax and keep your skin clean, clear, and smooth. The De-Stress Muscle Release Treatment includes a full body exfoliation with warming essential oils, using a muscle gel infused with oils of black pepper and rosemary, a deep tissue massage that concentrates on tired muscles and joints, and a soothing scalp massage. The Keraleeya Abhyangam Treament includes a massage, Marma Foot Massage, Herbal Steam and Herbal Ritual Bath. It is distinctive in using harmonious strokes, using balancing oils for deep relaxation.